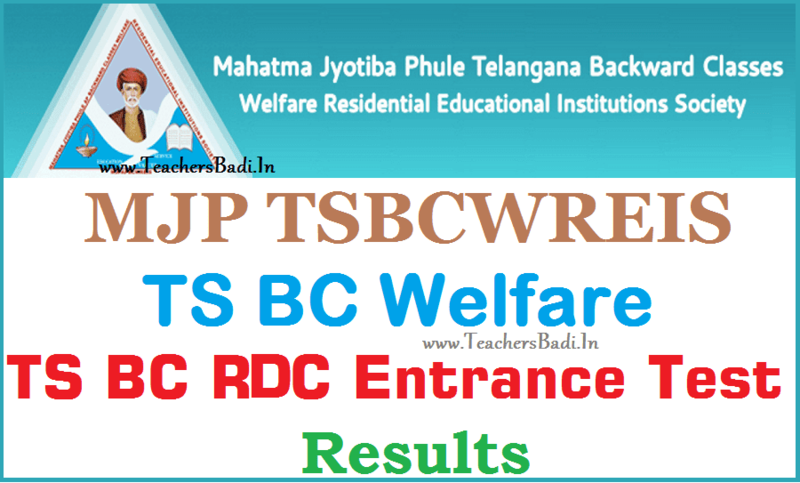 MJP TS BC Welfare RDC CET 2019 Results, TS BC Welfare TSRDC CET Results 2019, MJP TS BC Welfare RDC Entrance test 2019 Results, MJPBCWRDC CET 2019 Results, Telangana BC Welfare #RDC CET 2019 #Results Released /#MJPTBCWREIS RDC CET 2019 Results Announced /Mahatma Jyothiba Phule BC Welfare RDC CET 2019 Results Released/Degree admissions test results: Mahatma Jyothiba Phule Telangana Backward Classes Welfare Residential Educational Institutions Society(MJPTBCWREIS) issued the WomanResidential Degree College Common Entrance Test(RDC CET) 2019 notification in March, 2019. Telangana BC Welfare REIS invited the online applications from the eligible students who were passed inter or inter appeared students for admission into Degree course in MJPTBC Welfare Residential Degree Colleges in Telangana State for the academic year 2019-2019. The Hall ticket Numbers of the selected candidates shall be made available on the website: mjptbcwreis.cgg.gov.in. Date of Counseling for First list candidates Will be informed separately. The jurisdiction for any appeal to be settled is in Hyderabad city courts only. The reference period for such appeal is before the completion of admissions of the academic year 2019-19 or before the last date of admission into first year Degree courses. Eligible students were applied for this stream through online mode at its official web portal. RDC CET 2019 applied candidates were attended the entrance exam and they are waiting for their results for admission into Degree courses. MJPTBCREIS official will upload the results of appeared students on its web portal soon. So, Telangana BC Welfare RDC CET 2019 appeared students can check their results from mjptbcreis website.